Rediff.com » News » Why is Imran delaying ISI chief's appointment? Why is Imran delaying ISI chief's appointment? 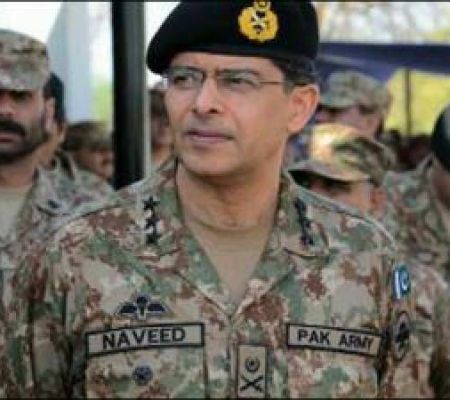 If Imran Khan delays his assent to General Bajwa's recommendations any further, it could imply he is taking stock of possible serious dissent within Pakistan's top army echelons, says Rana Banerji, who headed the Pakistan Desk at the Research and Analysis Wing, India's external intelligence agency. IMAGE: Pakistan's army chief General Qamar Javed Bajwa, right, with his troops. More than a week after the promotions of three star generals were announced, there seems to be a glitch in the formal appointment of the new director general, Inter-Services Intelligence Directorate, ISI. A 'report' surfaced in Khabrain, one of Pakistan's largest circulating Urdu dailies, alleging that there was a plot to kill Pakistan army chief General Qamar Javed Bajwa, hatched by Lieutenant General Asim Munir and outgoing ISI chief Lieutenant General Naved Mukhtar. According to the Khabrain 'report' the plot involved air defence officers who would shoot down General Bajwa's helicopter as he returned from a foreign trip. General Bajwa has just returned to Pakistan from a three-day trip to Jordan. 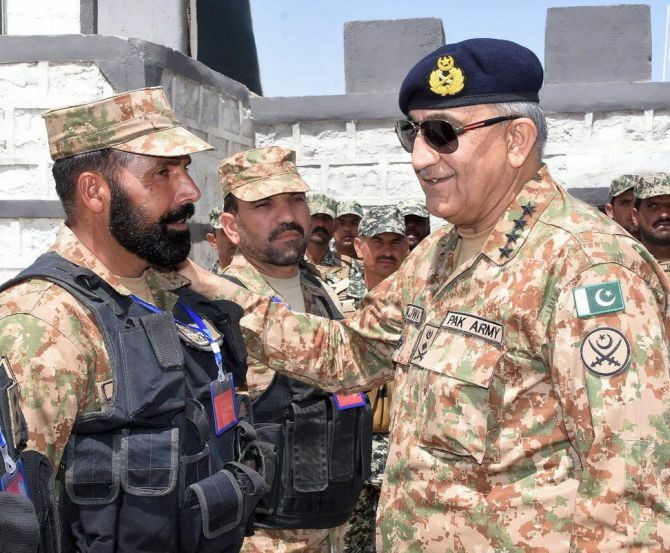 He then hot-footed it to Quetta where Prime Minister Imran Khan was given a security briefing at the XII Corps headquarters on the Baluchistan situation. IMAGE: Lieutenant General Naved Mukhtar, former director general, Inter-Services Intelligence Directorate, ISI. The 'report' is authored by by Zaid Hamid, a known maverick journalist who carries little credence. Hamid was discredited by the ISI itself after being patronised for years to spew anti-Indian propaganda. In November 2008, Hamid claimed Mumbai 26/11 was a 'Hindu-Zionist plot'. In 2013, he alleged a similar plot to kill former army chief General Ashfaq Parvez Kayani, ostensibly for his 'pro-democracy' views. In 2015, he was arrested by the Saudi authorities while on the umra with his family. Hamid is a Muhajir. His mother was reportedly from Kashmir. The mainstream media in Pakistan has ignored the report so far. 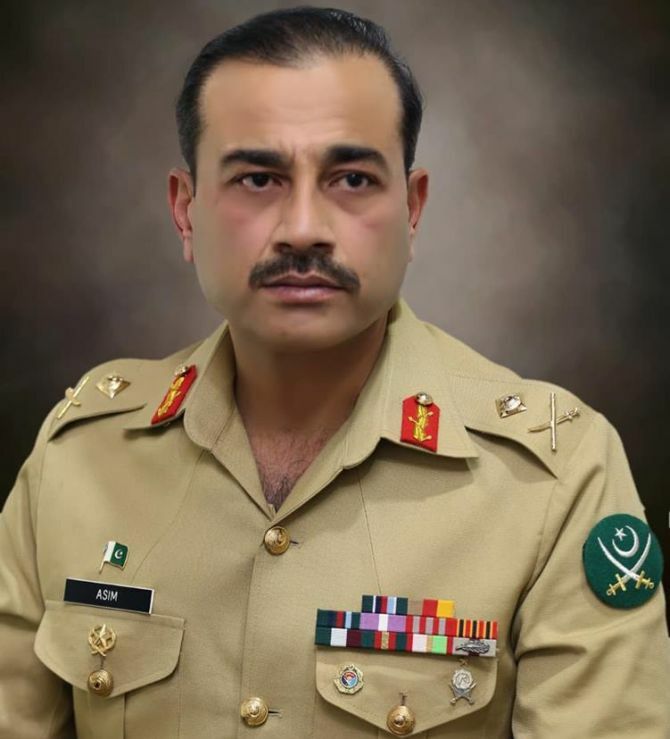 Lieutenant General Asim Munir, director-general military intelligence, is considered to be close to General Bajwa and tipped to be his favourite for the ISI post. The delay in the announcement and this frivolous report could be a ploy from some of General Munir's disgruntled peers who consider him too junior to hold the prestigious DG ISI job. If Imran Khan delays his assent to General Bajwa's recommendations on the new promotions any further, it could imply he is taking stock of possible serious dissent within top army echelons. If the differences are assessed as serious, the ISI job could go to someone else like Lieutenant General Nadeem Zaki Manj, a previous DGMI, now GoC 33 Division. Quetta. It could also sow the first seeds of tension between the army chief and an elected prime minister. Otherwise, it could be just another storm in a tea-cup in Pakistan's conspiracy-ridden Urdu media. The delay in announcing the charges of the new three star generals is certainly unusual. Who will head the ISI?